If there's one thing I undoubtedly have a knack for, it's thrifting. 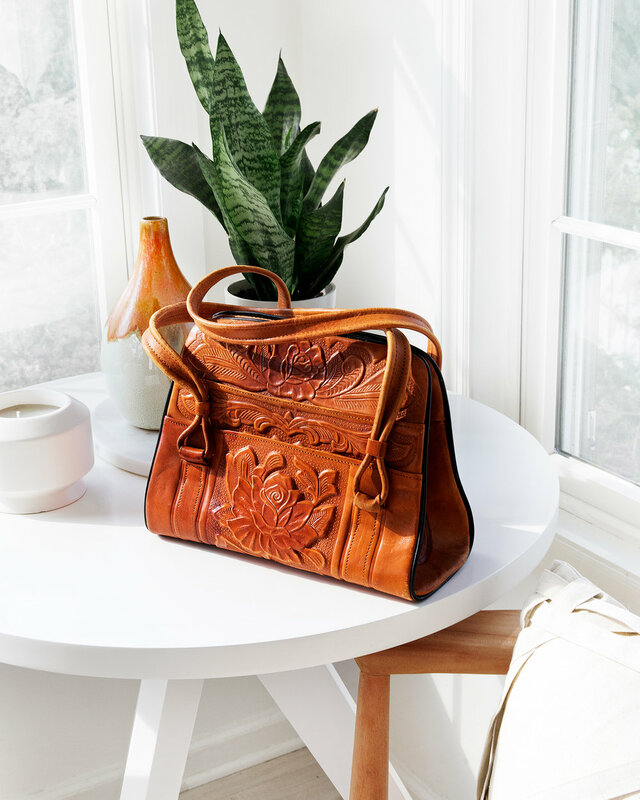 I love to mix a steal with a splurge, and find that re-purposing my secondhand finds is just as much part of the thrill, as is discovering a piece that had been long since forgotten, neglected or tossed aside. I've been on the hidden gem hunt that is thrifting since I was a kid, and as an adult I've learned how to fine tune my search, weed out the junk, and score deals that make the hours of digging worthwhile. These old essentials I've discovered recently are given new life once washed and restored to use, and while some days you find nothing, there are other days peppered in when you find $180 Marc by Marc Jacobs unworn white leather sneakers with the original tags still on them, just sitting all by their lonesome on a shelf in Goodwill for $5 (the sneakers you see pictured are just those ones, and I did a very serious happy dance after finding them). Days like that feel triumphant, and maybe worth bragging about just a little. This is the time of year I have the biggest itch to thrift. I am love love loving every ounce of summer that I can soak up, (my husband finally turned me into a summer person!) but fall is less than two months away. While I try to wrap my head around that, I must admit that I am starting to get just a little bit excited to swap over to a more layered wardrobe. I went thrifting a couple of times over the summer so far, and had the best luck with pieces that work well now, and for that seasonal transition time. 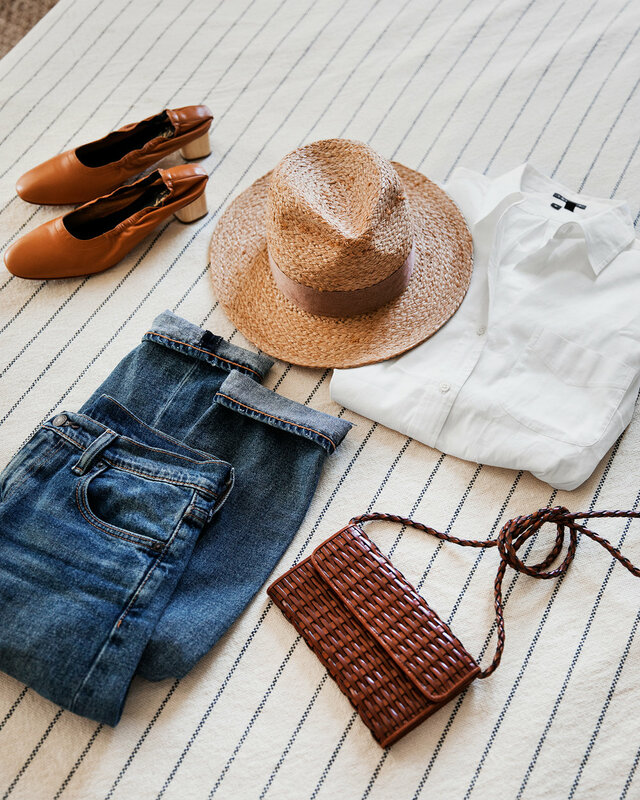 I've been sticking closely to my pared back summer wardrobe, rarely straying from a mostly neutral + white uniform, which makes these finds easy to work into what I've already been wearing. I scored the perfect oversized linen jacket, linen drawstring pants, oversized denim shorts, a couple of oversized white button downs (one being from Theory that has the just big enough, lived in feel I've been searching for since I can remember), vintage Levis from the boys section, and two leather bags that have just the right amount of detail. I shared some thrifted finds in my Stripes + Denim post from around this time last year, which featured the classics that I start to keep an eye out for in August and September before fall arrives. I wanted to share a couple of tips + tricks that come in handy this time of year as we start seeing cold weather inspiration popping up, even though we're all still sticky and melting out there in the wild. My biggest rules? Ignore sizes, denim is key, and wardrobe staples are easier to find than you think. There's always a good button down to be found, or even a cashmere sweater. While I've found some amazing one off pieces, sticking to one idea of what you're looking for is always helpful when navigating a generally unorganized mess. This linen jacket featured here is labeled an extra large, and while that's not a size I'd usually take, it has the most perfect oversized fit. Same with the cuffed denim shorts and the linen pants below. I had the waist taken in on the shorts because I loved how baggy the legs were, and I've been living in the linen drawstring pants ever since I snagged them. The pants are marked a petite, mind you! Which I am certainly am not at 5'9". They're incredibly comfortable, and perfect for summertime lounging. Sometimes I just have a feeling that there's going to be good stuff to be found, so I'll usually go at off times to really get in there and dig without lots of other people around. My favorite grey sweatshirt is a boys large, thrifted a while back and it has a real shrunken fit on me that I love, and it's the main reason why I always check the mens + boys section. The fit is often too perfect to ignore, and it's where you're likely to find the hidden gems.